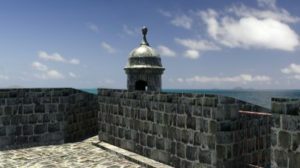 Constructed in 1540, Castillo San Felipe del Morro was built on a rocky peninsula to control the entrance to San Juan Bay, Puerto Rico, in efforts to resist attacks by both the English and the Dutch. Control Point was approached by John Feinberg from The Collaborative Inc. to scan and produce a 3D Revit Model and 2D Partial Topographic Plans of the exterior of this fortified wall in order to secure additional funding for the preservation of this historically significant site. Prior to starting the project, a site meeting occurred between all parties involved with the project in order to organize parameters, walk along the wall with guides and ensure that the entire process evolved smoothly. The challenges that were faced by Control Point was creating a traverse loop, unpredictable weather conditions and unmanaged vegetation along the base of the wall. A specific challenge included the degree of the angle between the base elevation and the top of the wall were almost parallel. “This required our field crew to set up the equipment on large irregular rocks that make up the shoreline. Setting up further away from the wall reduced the angle and increased visibility to the top of the wall allowing our field crew to close out the traverse loop,” said James C. Weed, Vice President and Principal. “For our project on the historic fortification walls of San Juan Puerto Rico, Control Point Associates, Inc. met the tight field schedule despite all of the potential contingencies that occurred. They also coordinated with us to work with data to actually see the nuances in the wall faces—their topography and to assist in determining changes that had occurred in the walls 450 year history. Control Point met all of the unusual challenges, thereby satisfying the project objectives,” Feinberg stated. This project required 5 days on site, 88 scans and 43 GB of raw data. The initial deliverables of the 2,600 scanned linear feet, 3D Revit models and 2D topographic survey were provided to The Collaborative, Inc. in efforts to increase funding for the entire site to be completed. As of February 2016, funding has been granted for the second phase of 16% of the total wall. Including installation of piezometers in seven boreholes behind the wall to monitor ground water and NPS crews repairing the wall face. 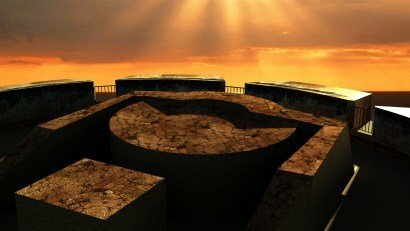 Castillo San Felipe del Morro was declared a UNESCO World Heritage Site by both The United Nations and The U.S. National Park Service due to its initial construction dating back to 1540. The final additional walls and canon-firing positions that can be seen today were completed in 1797. For more information about how Control Point Associates, Inc.’s traditional surveying services or laser scanning technology can assist with your project goals, visit www.cpasurvey.com or call 908-668-0099.